I'm sure you have heard of Daylesford Organic Farm, but I had completely underestimated the scale of it. I was blown away by it and think you will be too. Over forty years ago, the Bamford family, or more specifically, Lady Carole Bamford, decided to turn her family’s farmland over to sustainable, organic farming, first in Staffordshire and then in the Cotswolds. What began as a simple passion for real food and a desire to feed her children better has grown into Daylesford as we know it today, one of the most sustainable organic farms in the UK. If you think you've heard of the Bamford name before, you would not be mistaken, it's the B in JCB. Those yellow mechanical excavators we are all so used to seeing on many a building site are from the very same family. Founded in 1945, JCB is now a £2.6bn business and very much Lord Bamford's domain. Lady Bamford created the Daylesford & Bamford brands and she is definitely the driving force behind them. What a couple! 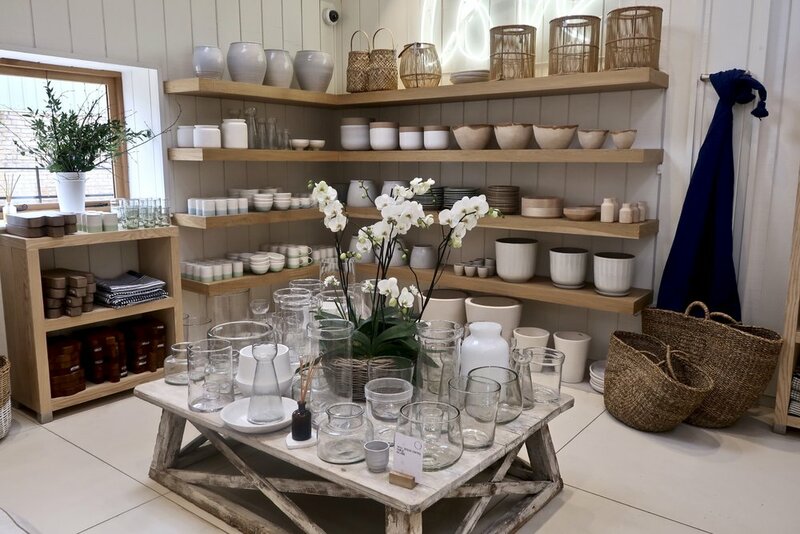 Situated in the heart of The Cotswolds, near Kingham, Daylesford has undertaken a significant expansion plan, and now offers a farm shop, home & garden ware, fashion, a restaurant, a cafe, cottages, flower arranging courses and even a cookery school. Did I mention, there's also a spa? More of that in a few weeks' time. About 10 mins drive outside of Stow-on-the-Wold, and just 2 mins from Kingham train station, which is on the mainline from Hereford to London Paddington, mean it's only 1hr 30 mins from London by train. If you drive, there's plenty of car parking. There are lots of famous residents, or at least people with holiday homes, the so-called Chipping Norton Set so don't be surprised if you happen to sit next to Alex James or Jeremy Clarkson when you're having your lunch! Farm & country meets understated & contemporary. I wanted to buy everything I saw! The food is just so appealing and beautifully packaged. I love the sustainability of everything that's on offer, you really get the feeling everything has been responsibly sourced and well made. Some of the things I picked up were pricey enough to make my eyes water a little, but not everything would break the bank. An abundance of white & stone gives a lovely clean & crisp feeling. There have been a few additions to the building, but the main stay is converted barns which adds a lovely feel to everything. The homewares are to die for and amazing quality. I could literally have bought everything, but I think I would have needed a second mortgage for that! I did treat myself and picked up a few things to remind me of my visit. As I stayed at The Wild Rabbit, a luxury pub that's part of the Daylesford estate, I was offered a 10% discount on everything at Daylesford Farm - an unexpected bonus! In case you missed it, I did a review on The Wild Rabbit a couple of weeks' ago. A huge variety of organic produce is on offer. There is a separate cheese room to keep the delightful smell contained, it's a cheese-lovers dream! You will also find a butcher & deli counter, a fantastic bakery, lots of exciting sounding condiments & pulses, wine and juices, not to mention, a wide selection of teas. There's a market garden on site and all the meat comes from within the farm. 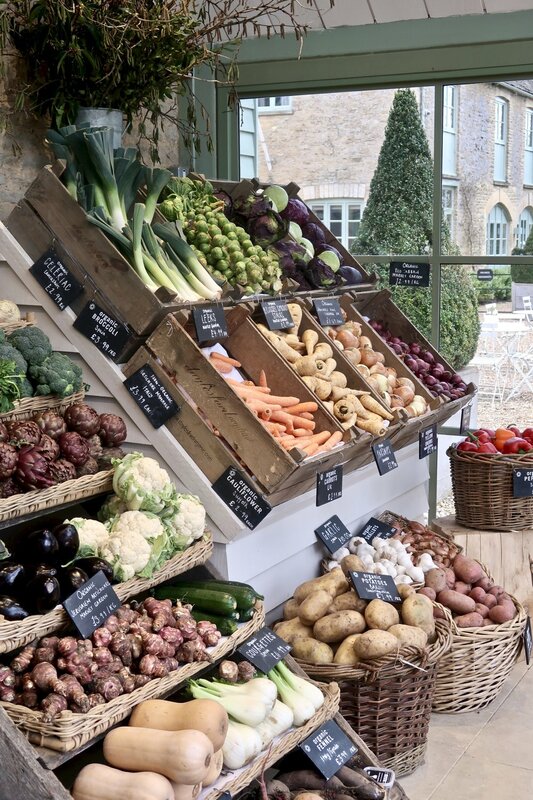 Daylesford is one of the most sustainable farms in the UK. Their philosophy means they want to grow, farm, produce and sell food according to their sustainable principles, and in harmony with the environment. Above all, they believe that when people eat natural, organic food, they can taste the difference. It’s a chain of goodness that begins with healthy soil and finishes with healthy animals and people. I love everything they stand for. This is definitely the most premium part of the place. Located just off a pretty courtyard as you walk through to the spa, this shop smells divine. The fabrics used on the clothes are super premium with price tags to match. This but was a little out of my price range - the one shawl I picked up was £650. Having said that, there were also some lovely premium diffusers that used willow instead of the traditional sticks which was a lovely touch. They were a bit pricier than the standard diffusers but there's no doubt they would look amazing with no need to hide that not-so-attractive diffuser behind something else to keep it hidden! Sadly, this time I did not get the chance to experience any of the classes but I would not hesitate another time. There are day courses as well as weekend courses available. I plan to go to the cookery school but stay nearby and make a night or weekend of it. There are a whole range of options available so it's worth checking out their website to see what's coming up. The Trough is the main restaurant where you can book a table and I saw quite a few people had done so, so I would recommend that if you are in a big group and don't want to be disappointed, but we had lunch in The Old Spot. Whilst the main restaurant is not formal, The Old Spot is definitely a more informal affair with high tables and bar stools the order of the day. The menu was filled with lots of fresh things to suit most appetites and they even have a pizza oven, where they create spelt pizza bases with the freshest of toppings, so I'm calling that a healthy pizza! Fresh juices & tea infusions are on offer and even the plain old tap water had lovely slithers of cucumber in. The glass was of course available in the shop and just so pretty. I know it's just a glass, but with it's simple decoration of white around the rim, it felt special. What an amazing place, can I move there now? With holiday cottages, a restaurant & spa all on site, you could really make a mini-break or holiday of a visit. There's plenty to see & do in the area and Bicester village is only 40 mins away if you fancy some outlet bargains.